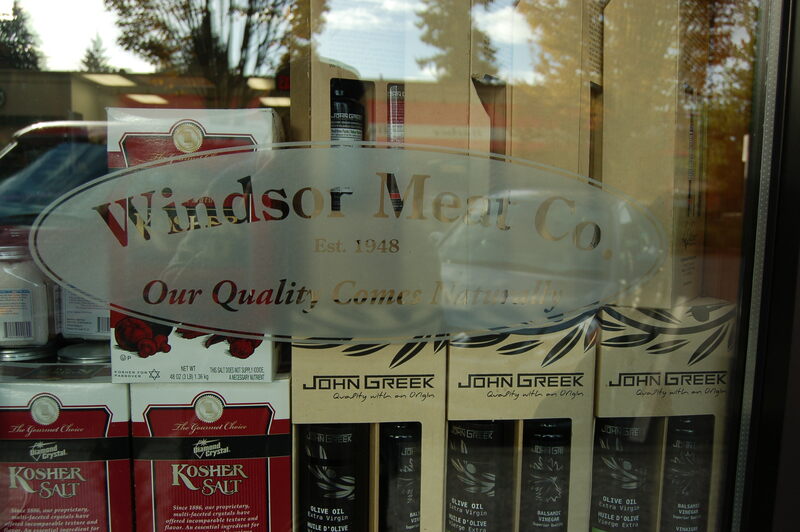 As I continued on my recent trek to butcher shop sandwich counters, I found myself in Edgemont Village in North Vancouver at Windsor Meats. 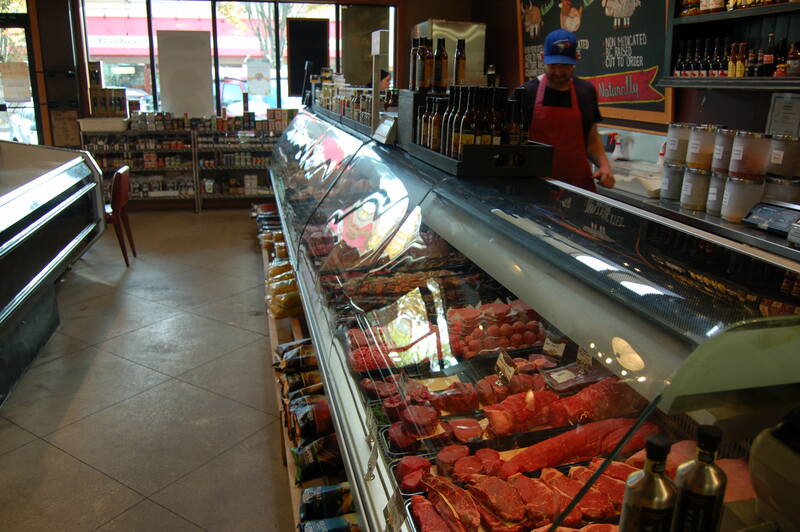 Windsor Meats has been a popular spot among West and North Vancouver residents since 1948, but it wasn’t until 2004 that their focused shifted to free-range, all-natural, non-medicated, local meat products. 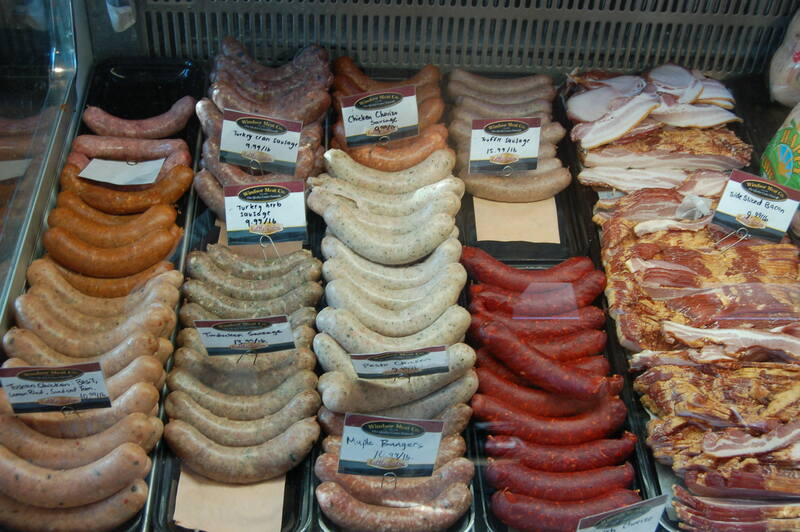 They also do house made sausages, have a great selection of deli meats and cheeses and a ton of sauces, oils, dry goods and pasta. 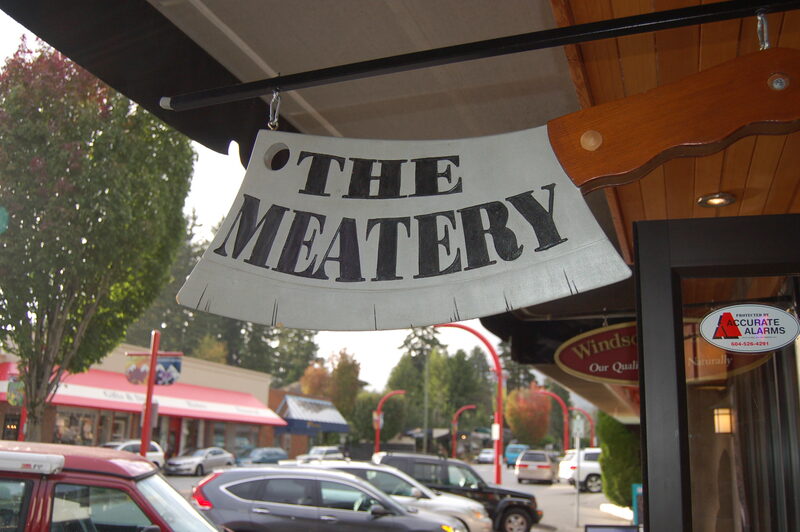 On top of that great stuff, earlier this year they opened The Meatery, a butcher to bun carvery sandwich counter right next door with 4 craft beer taps! 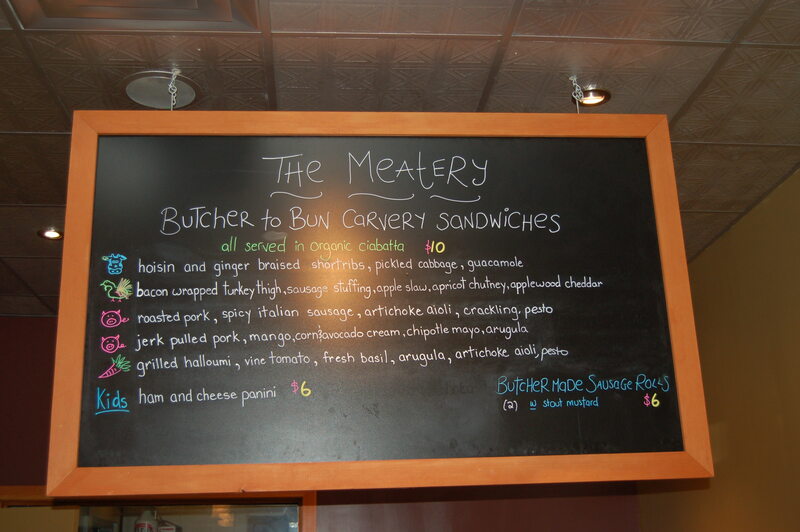 The Meatery offers five different sandwiches all served on organic ciabatta bread. I tried halved versions of three of the five and one of their incredible and huge house made sausage rolls with stout mustard. 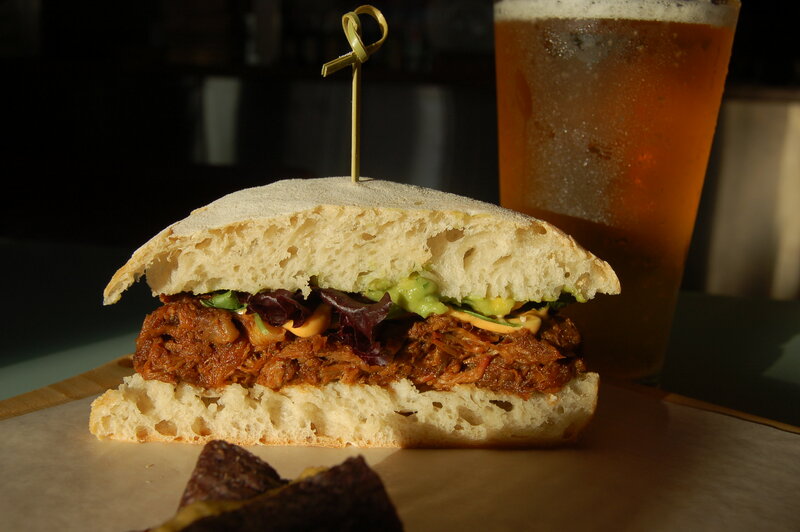 The first sandwich was the hoisin and ginger braised short rib with pickled cabbage and guacamole. This was my favourite of the three, the flavor reminded me almost of a Mexican mole sauce and the guacamole was surprisingly great with the Asian flavours in the meat. The second was bacon wrapped turkey thigh with sausage stuffing, apple slaw, apricot chutney and applewood cheddar. This one was also awesome, the smokey bacon cradled and kept turkey thigh nice and moist, the apple slaw had great crunch, the apricot chutney was bright and tart and the applewood cheddar was perfect. And, finally it was a jerk pulled pork with mango, corn & avocado cream, chipotle mayo and arugula. The jerk pulled pork had great heat and a nice sweetness, that heat was nicely mellowed by the corn & avocado cream and the mango and chipotle mayo brought another sweet/heat combo that was really tasty. All were delicious and totally unique. 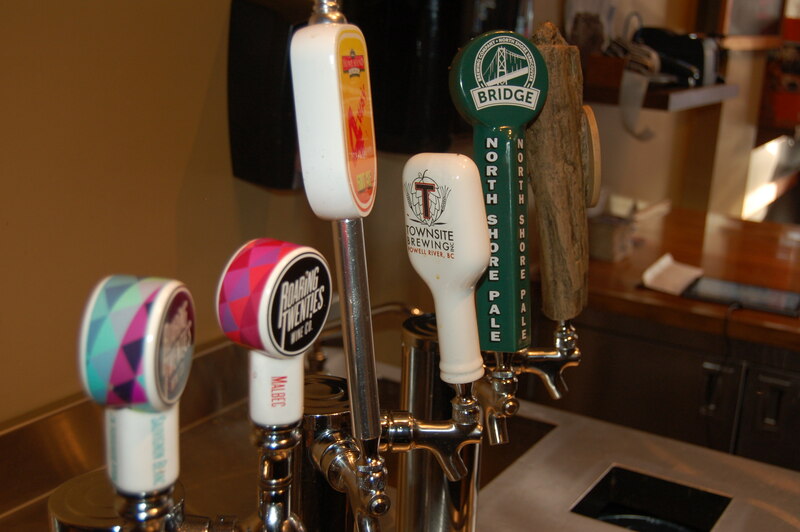 As I mentioned before The Meatery is a licensed spot with 4 rotating craft beer taps. 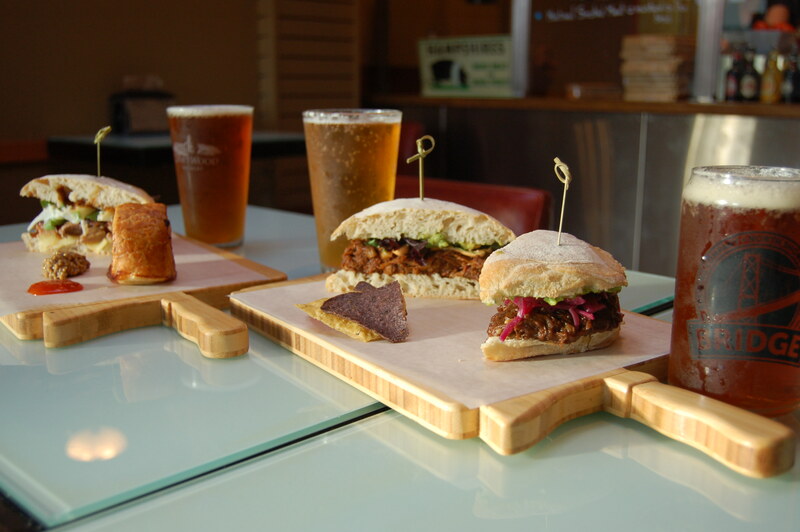 The tap list is well curated and beers are specifically chosen to be paired with the sandwiches. 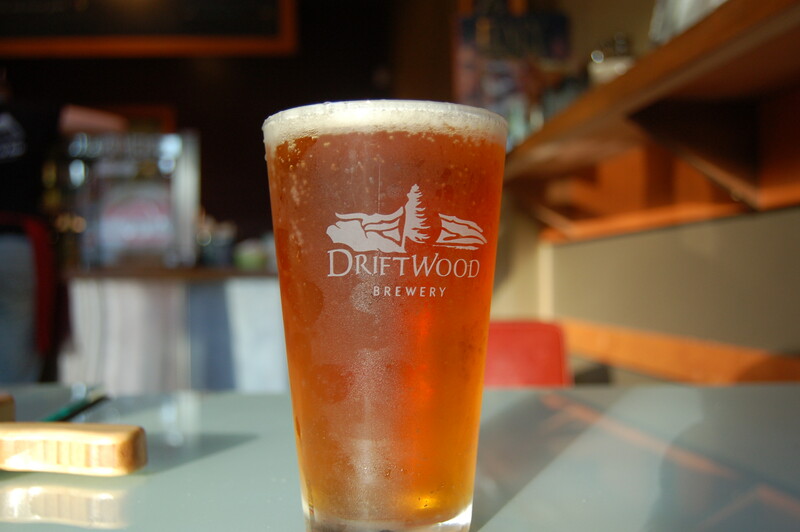 Currently they are pouring Driftwood Fat Tug IPA, Bridge Brewing North Shore Pale Ale, Townsite Zunga Golden Blonde Ale and Howe Sound 4-Way Fruit Ale (this one I think has changed now). The pairings went as follows, the braised short rib with the North Shore Pale Ale, the turkey with Fat Tug and the jerk pulled pork with Zunga Blonde Ale. 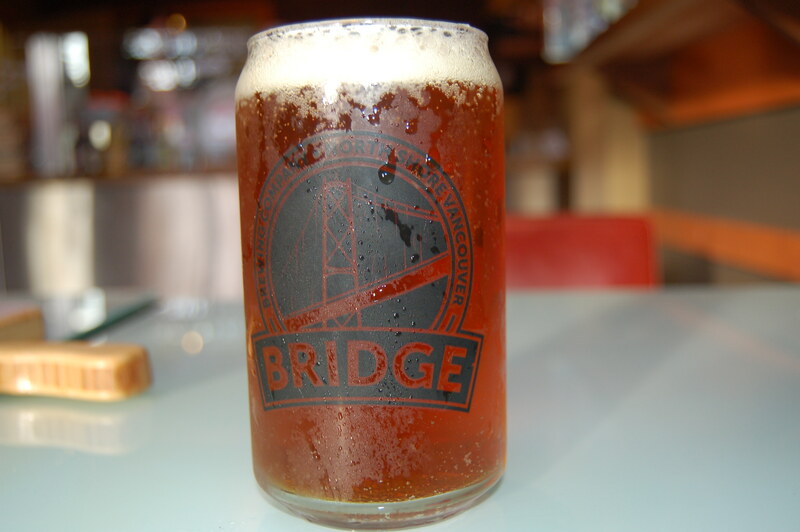 Loved the pairings on each of these, the malty North Shore Pale Ale from Bridge was great with the sweetness of the hoisin and ginger braised short rib. The big bold hop flavor in the Fat Tug was awesome with the smoky bacon, while citrusy flavour from the hops found the apricot chutney creating a nice floral taste. The Zunga Blonde Ale was nice and light with a nice bitterness, that was perfect to mild the heat from the jerk pulled pork, and still allow the sweetness from the pork to last after each sip of the beer. So, if you’re looking for an awesome butcher to bun carvery sandwich paired with a great local craft beer then head to The Meatery for These Sandwiches and Those Beers. 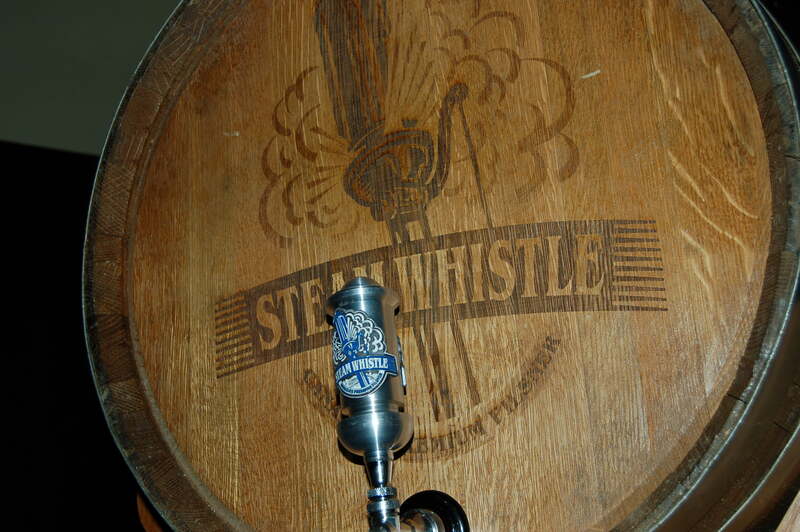 Check out www.windsormeats.com and www.themeatery.ca, as well as www.bridgebrewing.com, www.driftwoodbeer.com and www.townsitebrewing.com for more info. 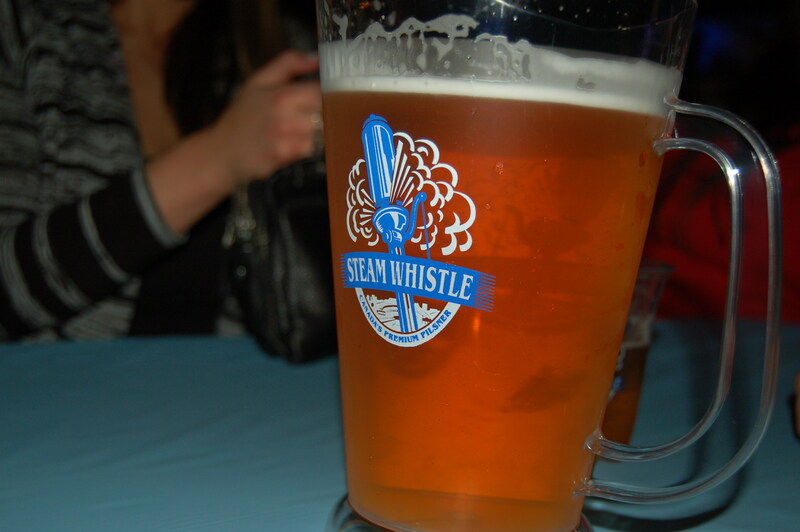 Follow them all on Twitter: @WindsorMeats, @MeateryB2B, @bridgebrewcrew, @driftwoodbeer and @townsitebrewing, and follow me @TSTB_blog. 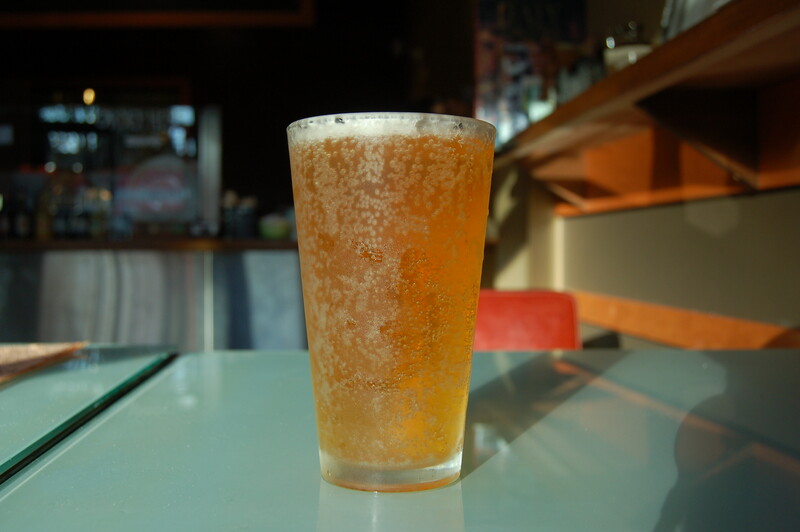 Head to Legacy Liquor Store to pick any of the beers on their own, or another craft beer from their huge selection. 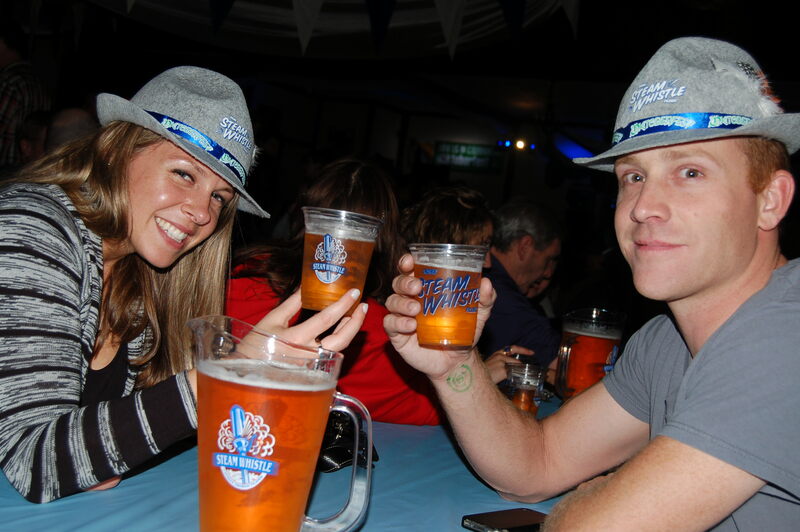 Also, check out my column in the BC Craft Beer News available at your favourite craft beer focused outlet and tune into “Just Here For The Beer” radio on Team 1410AM Oct 19 at 12pm PST. 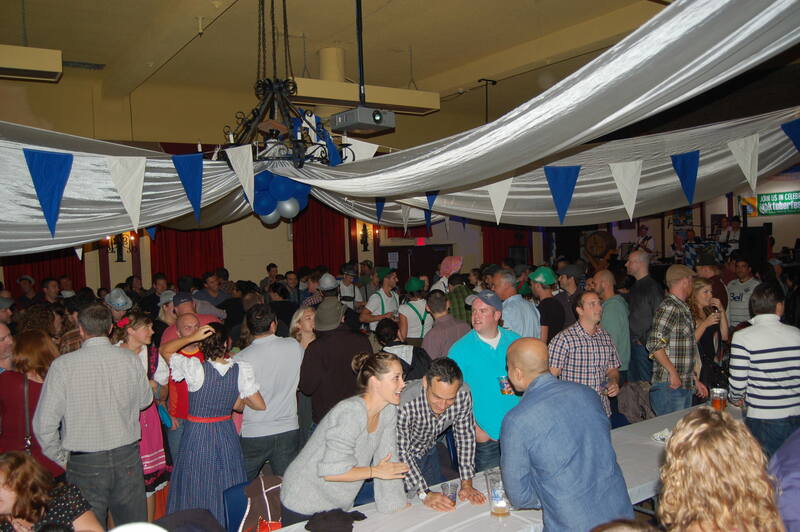 Steam Whistle Oktoberfest at The Alpen Club. 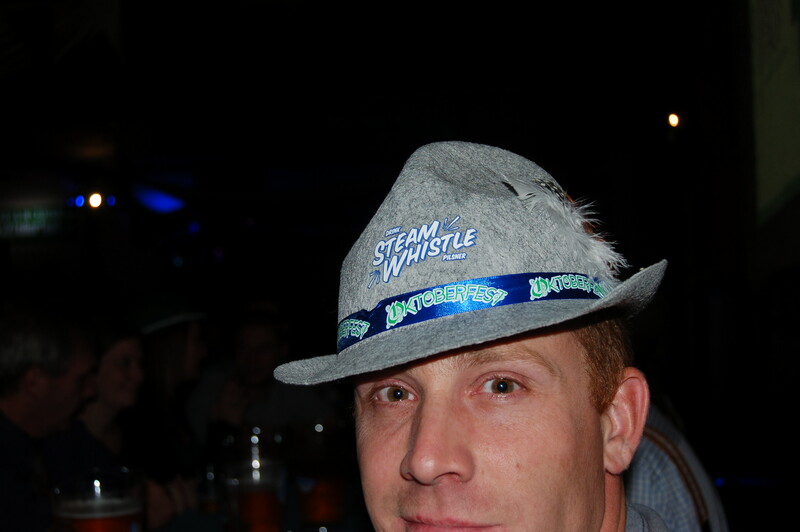 Steam Whistle threw an Oktoberfest event at The Alpen Club in Vancouver a couple weeks ago. I ran a contest and got to attend the event with a couple contest winners. 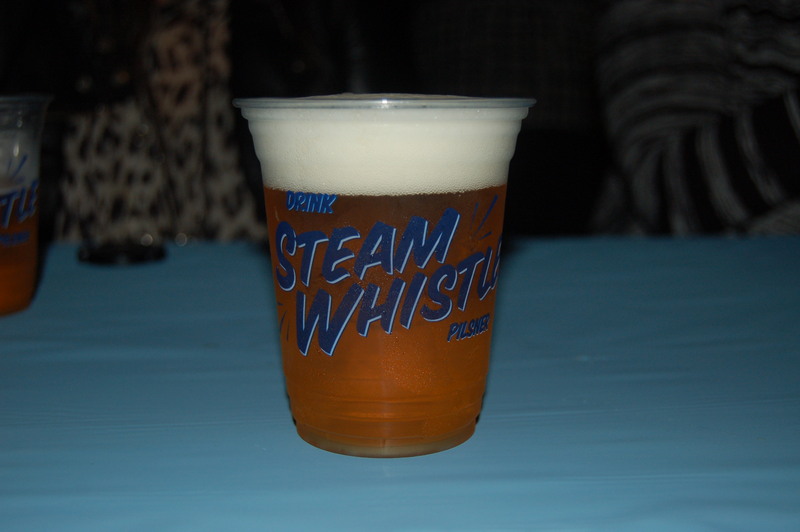 The event featured Steam Whistle Pilsner being poured for the 350 guests who attended the sold out event, as well as German food like bratwurst, schnitzel and pretzels. 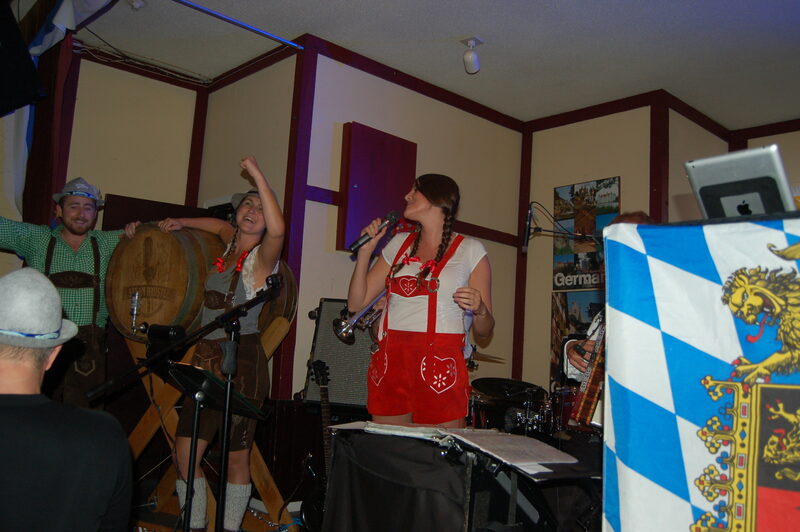 A traditional German band also played drinking songs for the crowd to sing along to all night long. 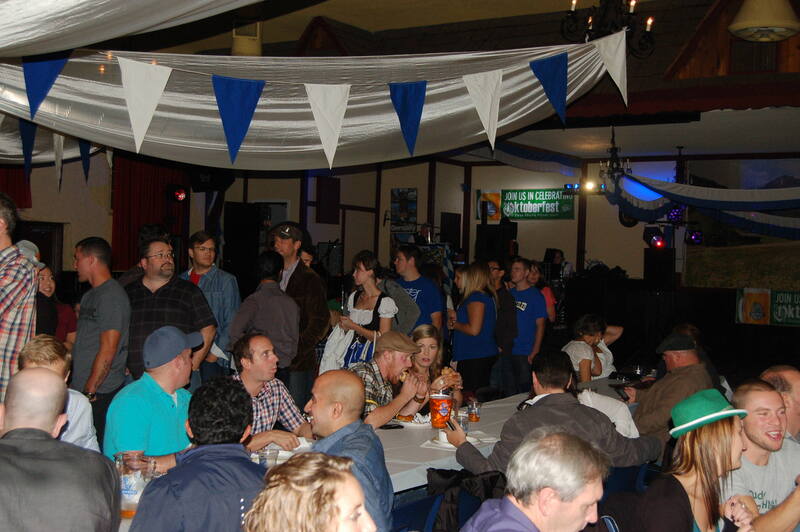 The crowd seemed to be having a great time and really getting into the spirit of the event. 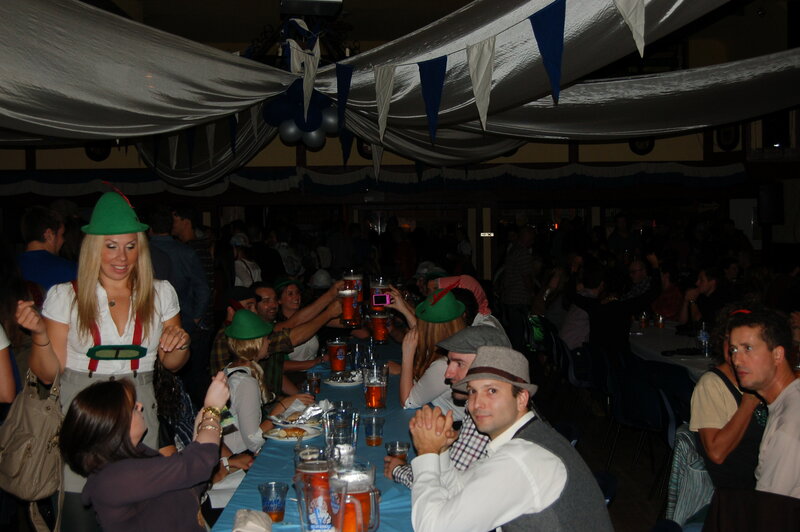 One complaint though was the lack of beer wenches bringing fistfuls of spilling beer steins continually to the long beer hall style tables. 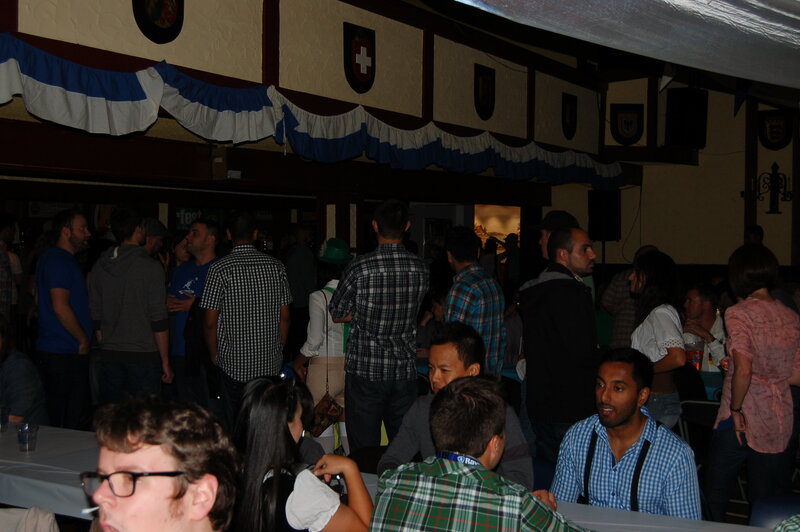 The one bartender dealing with the entire crowd seemed understandably overwhelmed. 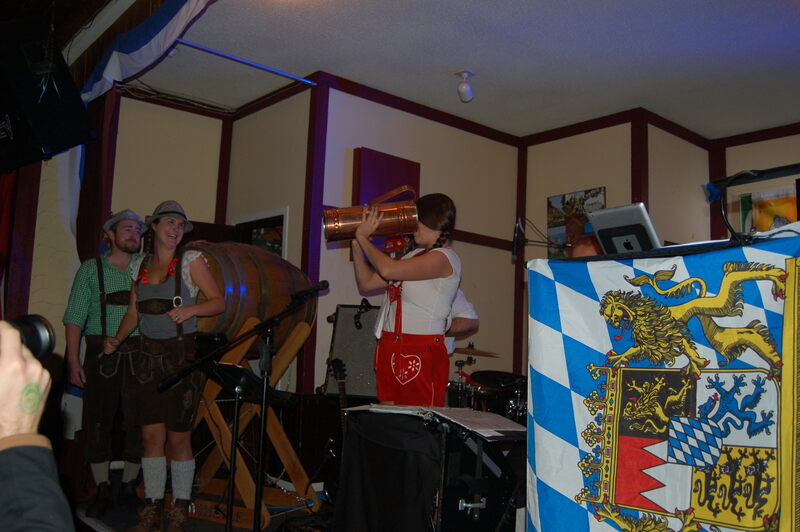 It was also unfortunate that due some archaic BC liquor laws, they were not allowed to serve beer in the 1L steins that we could only receive on our way out the door. 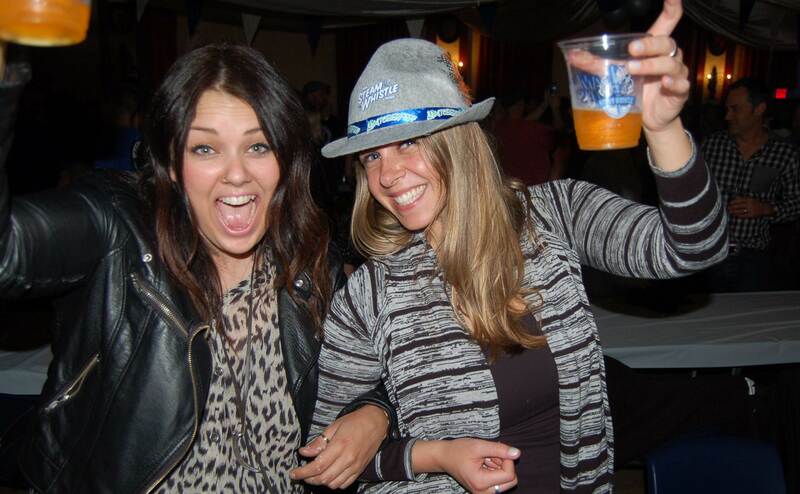 But fun was still had. 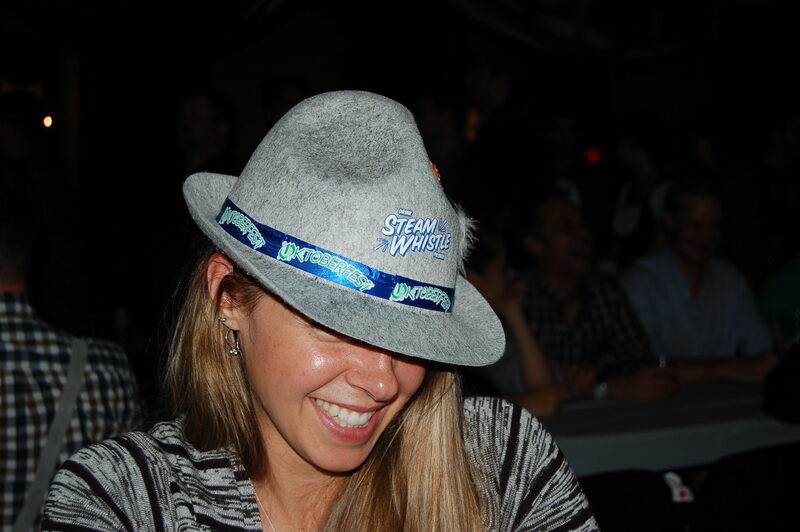 Thanks to Steam Whistle for having me to their event and I look forward to the next one! 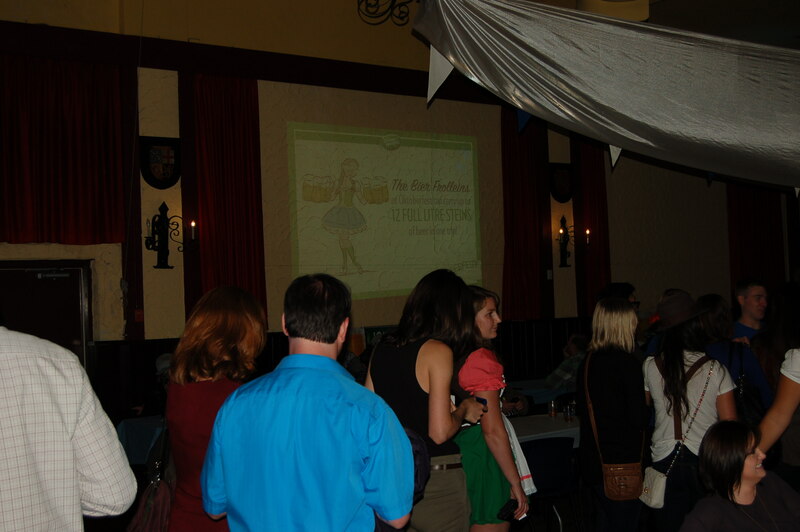 Here some photos from the event. 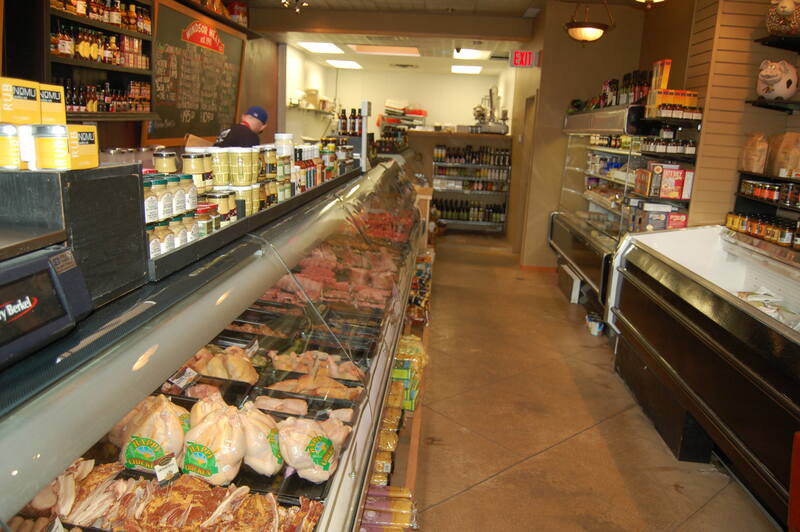 My last post on Big Lou’s Butcher Shop featured their Peameal Bacon sandwich which was awesome. Since then they have revamped their sandwich menu, moving a few sandwiches into a rotation as weekly(ish) specials and the “all the time” options have been slimmed down to feature the most popular ones. Luckily one of my favourites is one that’s always available. That last post was also before they were named the #2 butcher shop in the Georgia Straight’s “Best of Vancouver 2013”, just another reason to head back in. 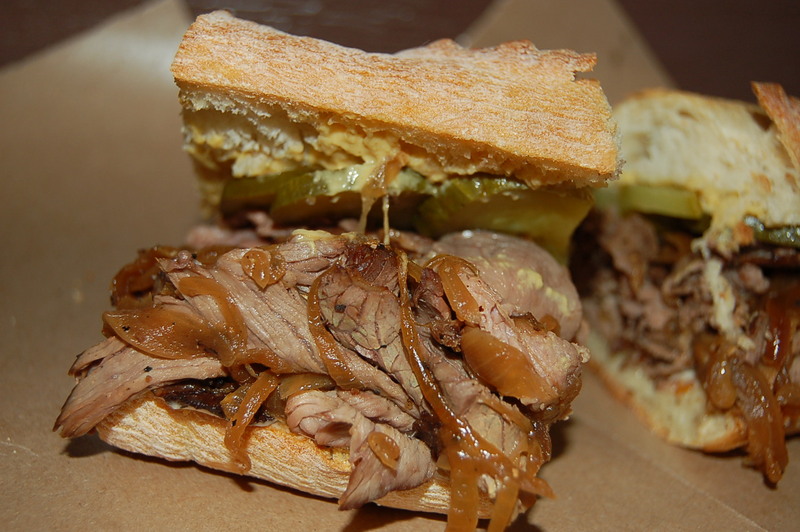 Big Lou’s Whole Roast Beef sandwich is a home run with slow roasted AAA beef, house seasonings, red wine, onions, pickles and pan mayonnaise on a fresh baguette. Not a lot of bells and whistles on this one, but that’s just fine as the juicy roast beef is the star. It’s super tender and the flavour is deep from the long, slow roasting process. This flavour is then reintroduced by the rich pan mayonnaise, this works great with the sauteed onions, sour pickles and the acidity of the red wine. I’ve had this sandwich many times and it’s always great, and this time was no different. 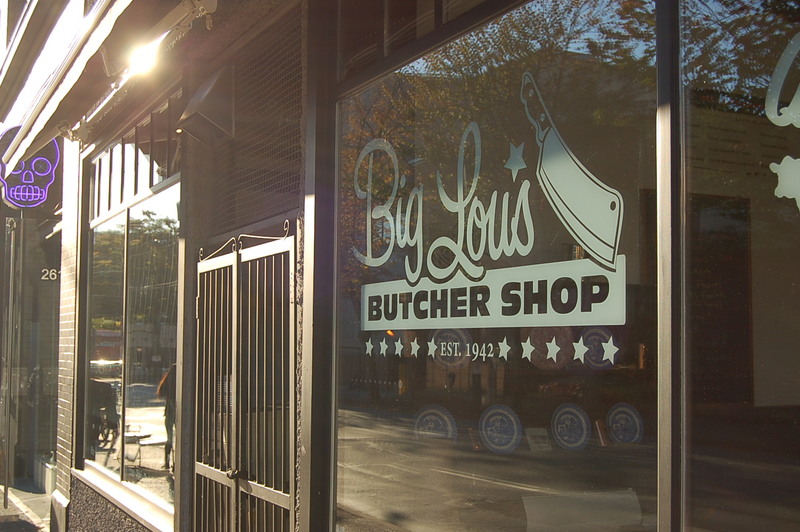 As I mentioned last time I posted on Big Lou’s they are a butcher shop, so not a licensed establishment. 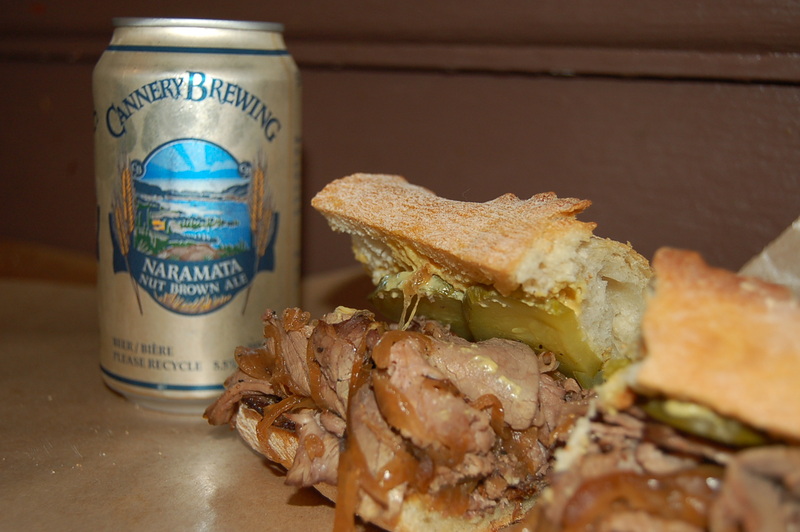 But this doesn’t mean you can’t grab the Whole Roast Beef sandwich to go and have it with a great craft beer at home, or in a park, or at the beach. When it came to the beer I wanted to pair up with this sandwich I wanted something rich, layered and with a smooth finish. A brown ale came to mind right away. So before heading to Big Lou’s to grab the sandwich I stopped at my favourite liquor store, Legacy Liquor Store to find a brown ale to pair with my sandwich. Legacy has an amazing selection of craft beer, so I knew that finding a great brown ale would be easy. 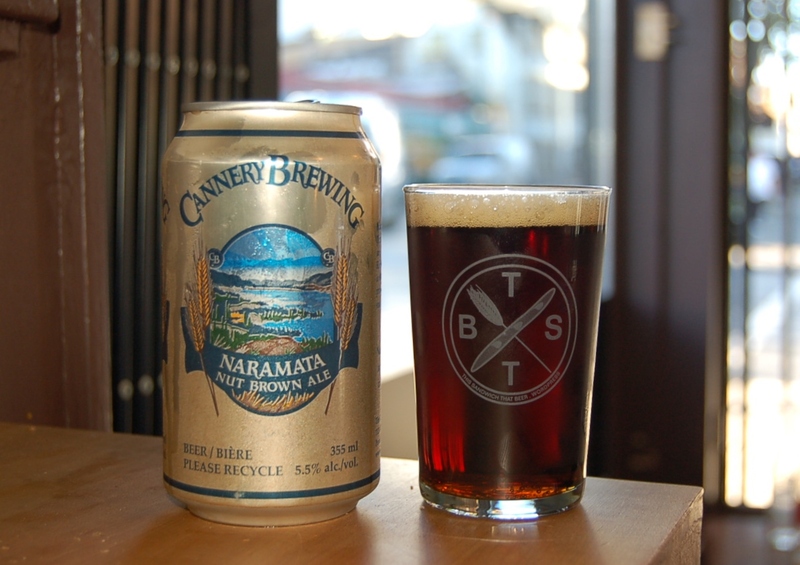 After exploring the selection, I decided on Cannery Brewing’s Naramata Nut Brown Ale. 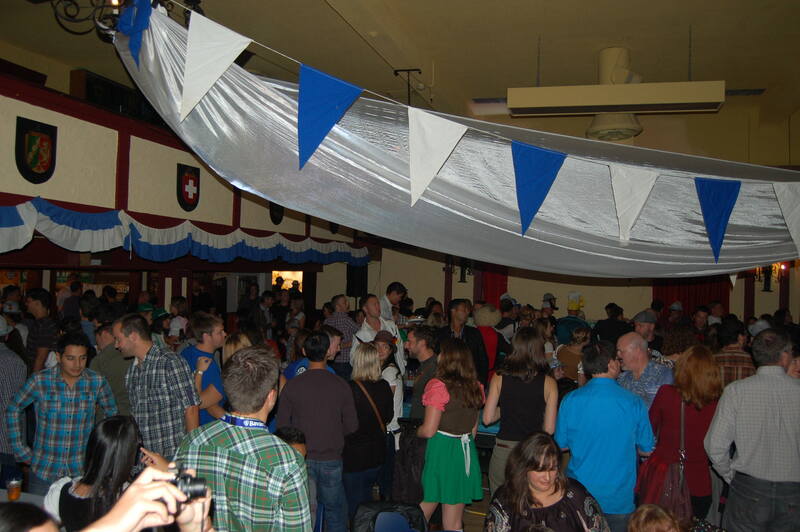 Cannery is a great small brewery that’s been brewing in Penticton, BC since the year 2000. Their nut brown is a classic English style nut brown, it’s full-bodied with a rich and gentle flavour. The rich dark malts are a layered mix of nuttiness and sweetness that was just perfect with the roast beef. While the slight bitter aroma and taste from the hops mingled very nicely with the accompanying ingredients. 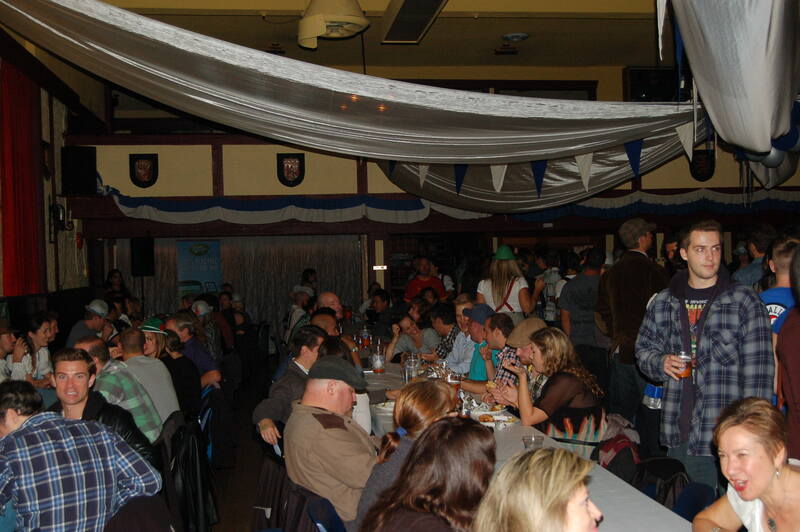 The lingering tastes from both the beer and the roast beef hung around on the palate enhancing the flavours after each bite. A perfect pairing. 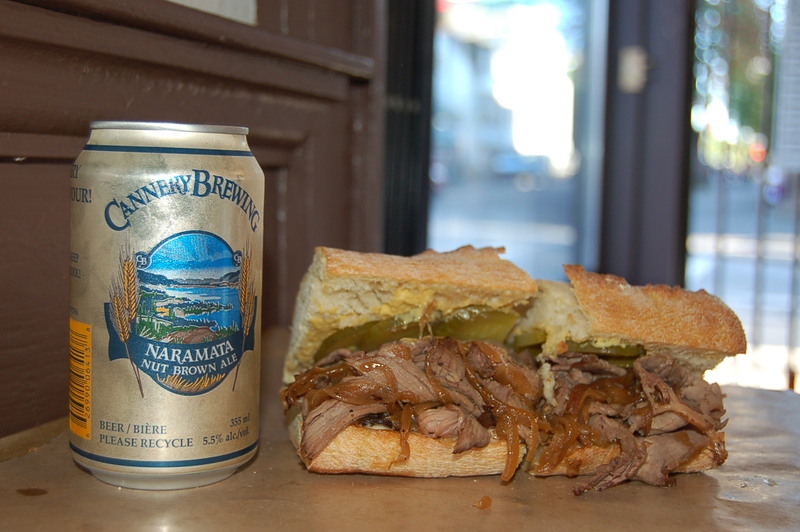 So if you’re looking for a roast beef sandwich that always delivers paired with classic nut brown ale from a great BC brewery, then head to Big Lou’s Butcher Shop for This Sandwich and That Beer. 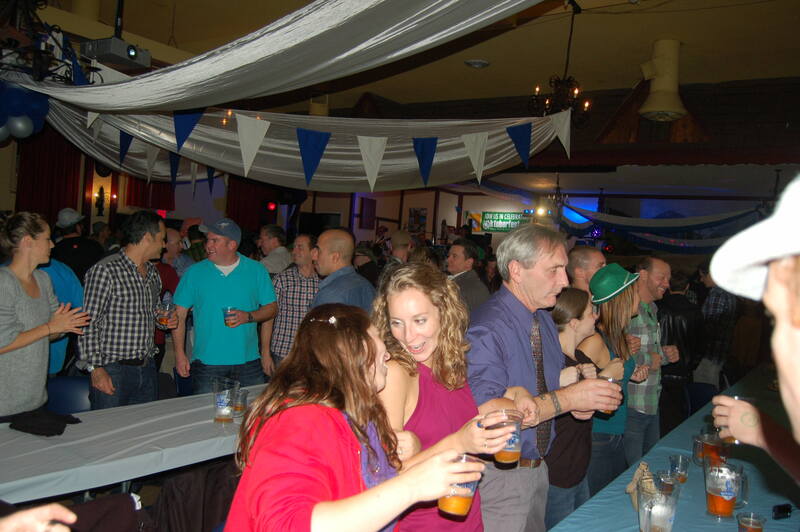 Check out www.biglousbutchershop.com and www.cannerybrewing.com for more info. 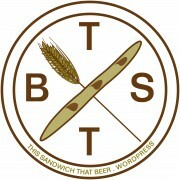 Follow them both on Twitter @biglousbutcher and @CanneryBrewing, and follow me @TSTB_blog. Head to Legacy Liquor Store to pick up the Naramata Nut Brown Ale or one of the many other amazing craft beers they stock. 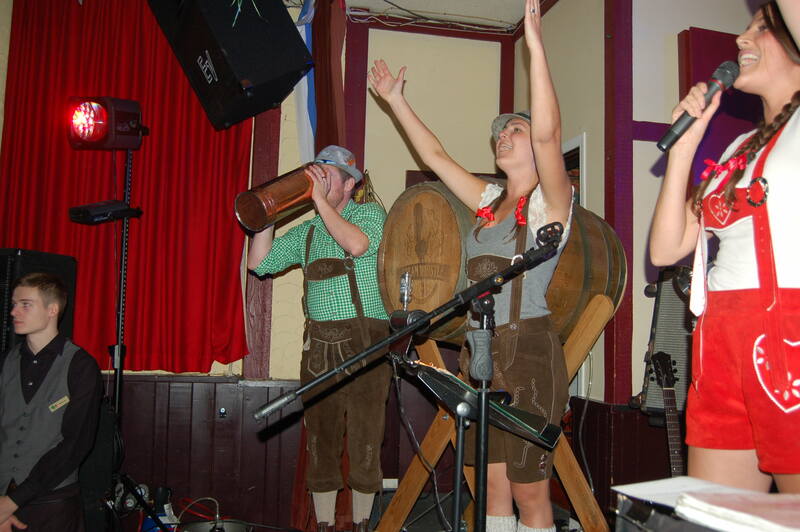 Also look for my latest article in the BC Craft Beer News at your favourite craft beer focused outlet, including Legacy Liquor, and also tune into “Just Here For The Beer Radio on Team 1410AM for my TSTB feature on Saturday Oct. 19th at 12pm PST.